1) Melt 12 oz of Shea Melt & Pour base in a microwave safe cup, about 45 seconds. In 6 cavities of your 12 bar silicone mold, pour a thin layer, about an 1.5 oz, or ⅛” – ¼” deep. Spritz with alcohol to get rid of any bubbles. 2) While waiting for your white layer to set up, blend your essential oils, if you haven’t already. I liked equal parts Tangerine Essential Oil, Ylang Ylang Essential Oil and Lavender 40/42 Essential Oil. 3) Cut up and melt 18 oz of Organic Clear Melt & Pour Base. Mix 20-30 drops of Non-Bleeding Teal with a few spritzes of rubbing alcohol (helps avoid speckling) in a small mixing bowl. Add as much of the the Teal to your melted clear soap base to get the color you want. Stir well to fully incorporate the teal. Add your essential oil blend and mix well. Because the Tangerine Essential Oil is orange, your teal may end up on the greener side if you have a tangerine strong blend. 4) While your clear soap cools to about 125 degrees Fahrenheit, unmold the white layer. It’s time to cut out the shapes that represent the “print” part of the soaps. This is best done using a craft knife. You can either cut your shapes free-hand, or print out a template to help guide your cuts. Anne-Marie demonstrates this method in this SoapQueen.TV episode. 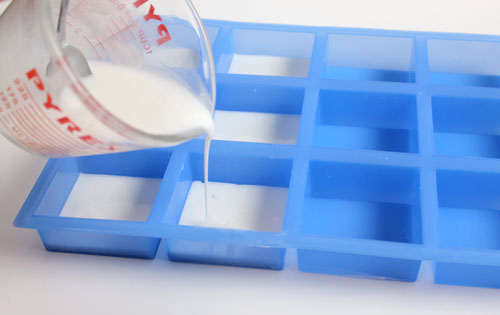 5) Prep your mold by spritzing with rubbing alcohol. Spray your cut-outs with alcohol and place them in the bottom of your 12 bar silicone mold. 6) Once your colored teal soap has cooled to around 125 degrees Fahrenheit, clear the skin off the top and pour slowly on top of your cut-outs. If they move, just reposition them with your finger and continue pouring. Spritz with alcohol to get rid of any bubbles. Let this layer harden to a point that will support the next layer. 7) Gather the shea soap scraps from cutting and melt with the leftovers from step 1, if you have any left. Mix 2-3 mini scoops of Activated Charcoal with Liquid Glycerin and mix well being sure to work out all of the little clumps. Add the Activated Charcoal mixture to the melted Shea soap base to produce a grey hue of your liking. Mix thoroughly. When the soap temperature is about 125-130 degrees Fahrenheit, spray teal layer with alcohol, pour grey atop your teal layer, and spritz again with alcohol to pop any bubbles. 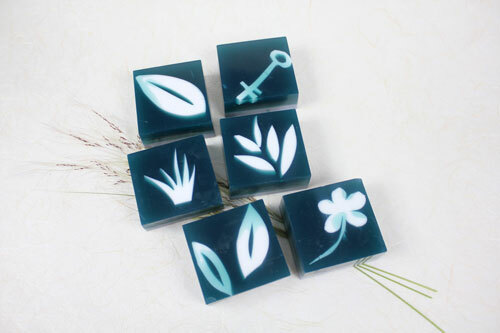 8) Once soaps have fully hardened, unmold and wrap as soon as possible to avoid glycerin dew. Are you a visual learner? Want to see a bar of this soap in real life? No problem! you can. Mosey on over to the Soap Queen Lab and and grab yourself a bar – you’ll get printed instructions too! I use the clear soap bases and would like your thoughts on the type of clear wrapping that i could use so that the moisture does not evaporate from the soaps , or sweat. also I am trying to find away to wrap the soaps so that they stay clear without fingerprint smudges all over them ? Thanks for your comment, grula! I have been trying to think of how to do this-cyanotype is one of my other obsessions!!!! Wow! Such a simple design yet stunning. I love the blue with the ultra white contrast. Awesome idea! I love sun prints. These soaps really capture that summertime nostalgia for me, and they’re just downright cool! Oooo I love that teal color! Love the contrast of the teal and white! Great job on the shapes, too. These are absolutely adorable! That gorgeous blue color really sets off the while shapes, and they are so neat and dainty too. Great job Simona! I do not do much M&P but I am also thinking that if your first pour of the white is not too thick you could use cookie cutters to get some shapes as well. What a wonderfully beautiful and creative idea.